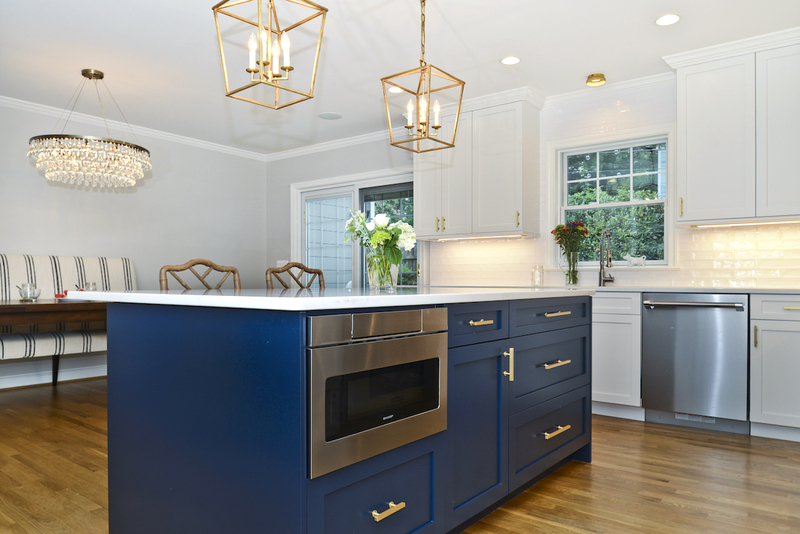 In 2018 Commonwealth Restorations, a remodeling contractor in Arlington, Virginia, introduced me to Morgan and her husband Stefan. They had two young children and another child on the way. They lived in a center hall brick Colonial home with limited space and a very small kitchen. The kitchen footprint needed reconfiguring in a big way for their growing family. Commonwealth designed the basic footprint for a new kitchen by adding on to the back of the house. 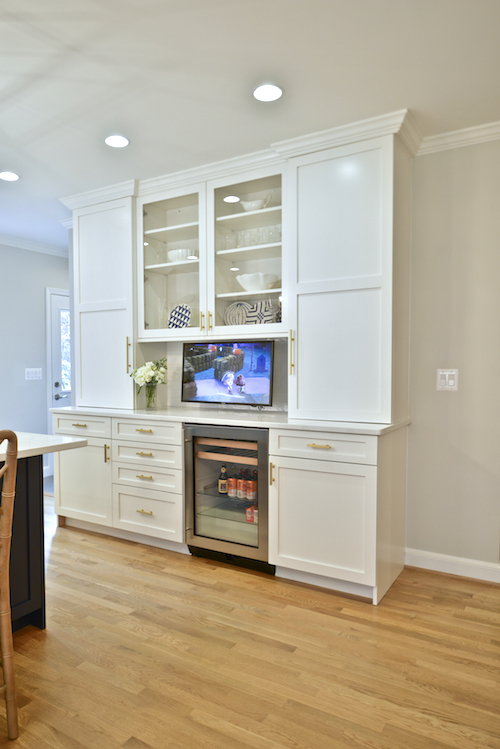 When I met with Morgan, she shared what features were most important to her kitchen. Her family was growing, and she wanted a kitchen that was functional and classy without being too casual. 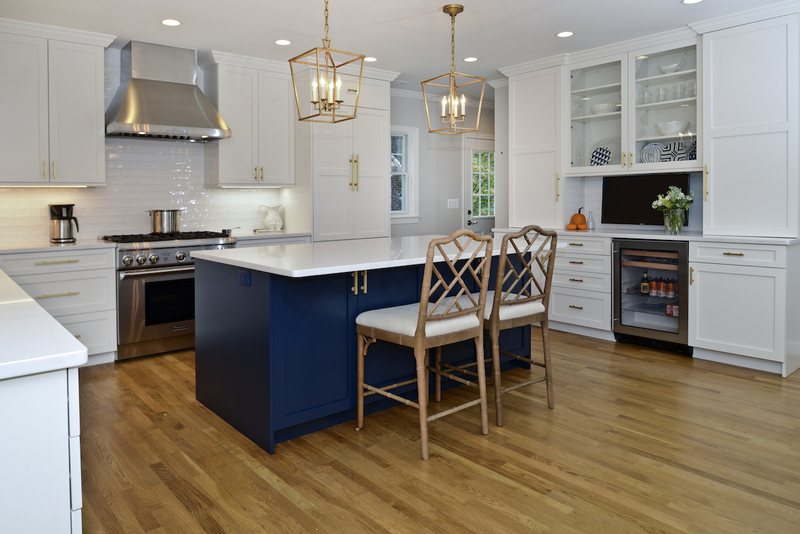 Because of the home’s limited space, she also wanted the eat-in portion of the kitchen to serve as the dining room when entertaining friends and extended family. 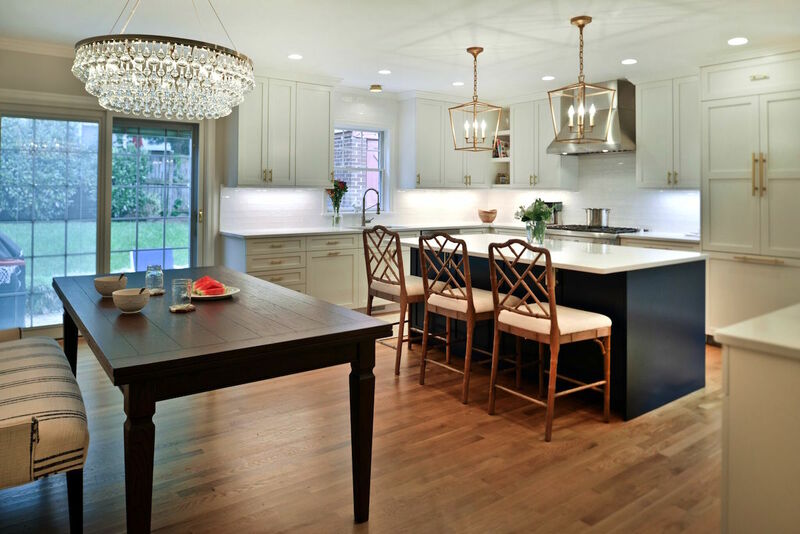 Now that formal dining rooms are becoming “dinosaurs”, Morgan was “spot on” by seeking to focus our design energy on making her new kitchen more upscale in appearance. 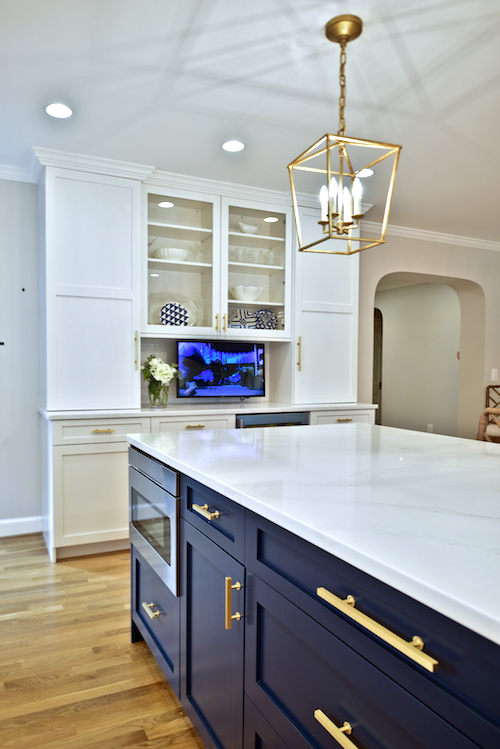 Morgan knew she wanted white cabinetry as well as a maintenance-free engineered quartz countertop. Beyond that, she wanted to know: what’s next? I explained that the first step was to select her kitchen appliances because they “drive the design” and I needed to know her selections in order to proceed with the drawings. I also noted that if she wanted a kitchen that looked truly elegant, typical “every day”-type appliances would not do. Morgan wasted no time making an appointment with a local appliance distributor. 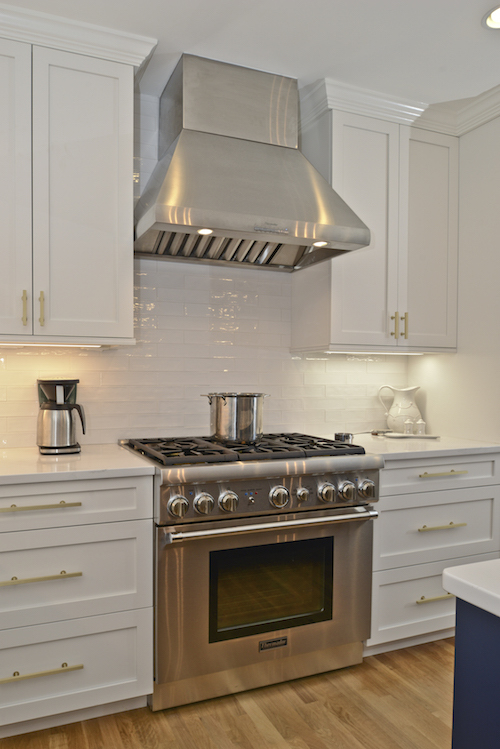 She selected Thermador for her 36” dual-fuel range, with a matching 36” professional hood above it. She also chose a 36” French door panel-ready refrigerator and a stainless steel dishwasher, as she was able to take advantage of the deal Thermador offered to achieve some savings. Once the kitchen appliance selections were made, I could start drawing. We decided, due to restrictions of space in the rooms adjoining the kitchen, to create an additional multi-purpose area that would serve as a pantry, communications center, and TV center, but would still would look attractive. The final decision to be made was the kitchen island. Morgan wondered: should we choose white, or go with her favorite color, dark blue? I gave her the thumbs up for the dark blue. 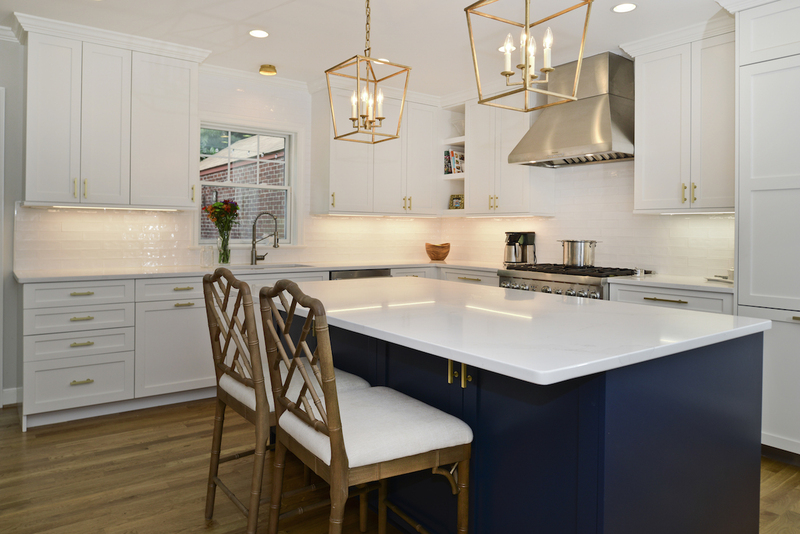 We chose Sherwin Williams “Naval”, and we then collaborated further by picking brushed gold cabinet handles, an elegant subway tile, and pendant lighting. The entire room now speaks for itself. One more thing I would like to add. During the design process, Morgan sometimes doubted herself, yet her instincts were correct. I tell my clients often, as I did her—most often, your instincts are correct. You just need an experienced kitchen designer like me to coach you along the way!